Gerda Baltutytė is a female student at the Klaipėda University in Lithuania where she studies National Security. Besides her studies, she is a citizen-soldier, an assistant to the military physician. We met at the Faculty of Social Sciences in Klaipėda in April 2018 and I asked her for an interview. You look very young to be a citizen-soldier. What is the motivation of Lithuanian youth to be a citizen-soldier; in particular, what is your motivation? First, thank you for your compliment. Second, my colleagues explain why they want to serve in the Armed Forces. The majority of them are motivated by patriotism. I would say that it is an influence of their parents and people who serve in the military. There are also financial bonuses and social benefits which motivate some student. Last but not least some would like to prove that they able to manage demanding training. Personally, I like to be challenged. I do not like monotonous life and being in the military means permanent action. In addition to that I can learn different skills and increase my knowledge in various areas. We must regularly take specialized courses in which we become familiar with new things. I feel great responsibility and I am honoured for being my country‘s protector and a medical assistant at the same time because I can contribute to prosperity and security of my country. When I visited the faculty in which you studied, I was surprised to see national posters aimed at recruiting students. Such approach is not common in the Czech Republic. There are no military posters at universities although two thirds of university applicants belong to the group of people who are able to join military. In addition to the posters, students at the Klaipėda University have their own military club. Will you describe how this club works? 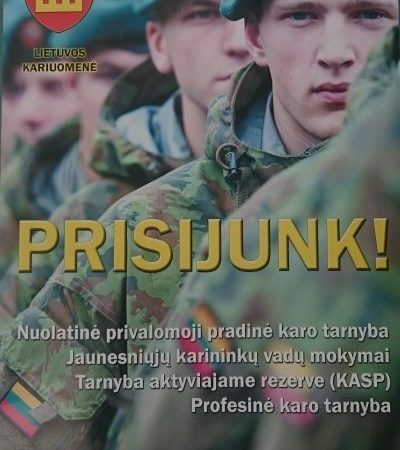 It is common to find military national posters inviting students into military at Lithuanian universities. Students are offered to join the Junior Officer Command Training (henceforth referred to as JOCT). The JOCT aims to train officers for the Lithuanian Land Forces. Students who are patriots will learn theoretical knowledge of warfare and practical skills necessary to command a reserve platoon. They will also understand the peculiarities of the leading company-size units, and they will obtain skills how to fight with arms to defend this country. An overall duration of the training is three years. It starts in September, finishes in June. It is organized every second weekend. There are eight classes a day. In summer, there are tactical field exercises that last 24 hours. JOCT takes place at the Military Academy of Lithuania in Vilnius and at the Lithuanian Grand Duke Butigeidis Dragoon Battalion in Klaipėda. Students of higher education institutions and those who are eligible for joining JOCT sign an application form in line with legal procedures. 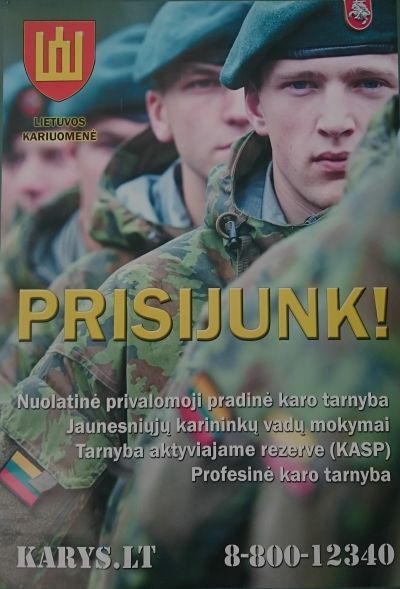 Then, the Military Conscription and Recruitment Service of the Lithuanian Armed Forces selects the best applicants. How many students are members of the club? Klaipėda University does not keep statistics about how many of their students are members of the Junior Officer Command. Is it possible to manage military service and studies? It certainly must demanding. 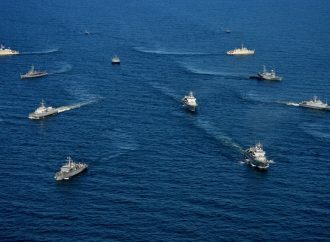 It is not easy to combine studies and military training because there are ongoing activities and it is also necessary to train outside the university. It takes a week or more. However, when you are motivated and committed to do that, there is always a solution. Commanders appreciate soldiers who are studying and they have a positive approach towards them. Lecturers of Klaipėda‘s University take extra care about such students. Moreover, such students can consult various issues with them. I am pleased that I can study for Master‘s Degree combined with the national security program at Klaipėda‘s University. You are a medical assistant at your military unit. What are your duties? Yes, I am an assistant to the military physician. It is a big responsibility and I find real satisfaction in helping others. I care greatly about my patients. I know that at first I will be a nurse and then a soldier. 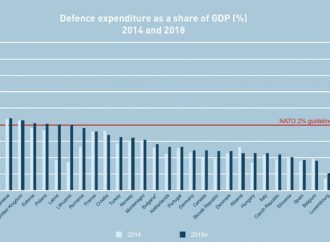 Is there a close cooperation among military units across Lithuania? What about cooperation among the students of military clubs? In Lithuania, military units cooperate very close but I am not familiar about military club cooperation. Does your club maintain any partnership with similar clubs abroad? I am not sure about that. I have not heard about any partnership with similar clubs abroad. What about cooperation with the Czech Republic in this field? I am sorry, but I have not heard about any cooperation with the Czech Republic in this field either. Maybe that you can propose such cooperation. Do you have any idea what you would like to do after your graduation? Are you going to stay in service as a citizen-soldier? Yes, I have some ideas and personal dreams about what I would like to do. Not only immediately after studies, but also in the future. However, it is necessary as we say in Lithuania „roll up your sleeves and get off to work“. Next year I will graduate from the MSc program. Then I would like to continue with PhD studies. My final Master‘s thesis will be about motivation, young people and military service. In the future, I would like to do a research related to the Armed Forces and soldiers in the context of national security and motivation. I would say that these aspects related to motivation are not sufficiently explored in Lithuania. There are many areas in this field that have not been scientifically dealt with yet. The conclusions should be practically applied. Moreover, conclusions should elucidate what to improve in the recruitment process. Talking about the second question, I can say that from today´s point of view I see myself serving in the military however we will see what is really going to happen in the future. Being a soldier is usually time-consuming. What about your family and close friends? Are they supporting you? It is true that it is a time-consuming job in which you do not have fixed working hours. It means that you do not start your work in the morning and go home at five in the afternoon. If you get a task in the military you must perform it regardless of time. Furthermore, you have to plan everything properly and be prepared to face any situation. At the beginning my parents were stressed that I wanted to join the military and not to work in hospital. However, once I made a decision, my parents were on my side. I am grateful for their support and understanding. I sometimes do not have much time for my friends but once I have free time, I try to be with them. If you had a daughter would you wish her to be a citizen-soldier? If I had a daughter, I would not mind her serving in the military. The most important thing in this service is motivation and commitment to success because both women and men can be great soldiers. Nowadays more and more women are involved in national security but their position in the military and their integration is not a simple process. It should be stressed that not all problems concerning women’s positions in the military have been resolved. Nevertheless, many positive changes have been introduced and I am glad that certain stereotypes formed by society are being eliminated. Sometimes, volunteers are seen as a burden for career soldiers. They might believe that citizen-soldiers are not usually well skilled and experienced. What is the relationship between career soldiers and citizen-soldiers? Nowadays, there are many things different in comparison with the past and one of them is the relationship between career soldiers and citizen-soldiers. There might be some career soldiers who believe that citizen-soldiers are not as skilled and experienced as they should be. However, as I view it, career soldiers share their own experience, knowledge and their skills with citizen-soldiers. In my opinion the relationship is really good. Tak mě při čtení napadla otázka. Jaká je motivace našich rekrutů a jaká je motivace našich záložníků? Stejná nebo jiná? A mají naši rekruti stejnou motivaci jako aktivní zálohy? Zajímal by mě skutečný stav, ne propaganda ministerstva. Petře, a už jsi si koupil hodinky na míru Prim od Elton hodinářská, a.s.? Nedávno byl průzkum jak jsou na tom ministři s angličtinou. Metnar propadl. Nejspíš je na tom podobně všichni jeho podřízení. Jde šeptanda, že někteří mají dlouhodobě individuální výuku, která se jim extra platí a stejně je jim to platný jako mrtvýmu zimník – všichni ale vykřikujou jak se všude domluví. Nedávno jsme jich pár na jednání mohli slyšet. To se mělo objevit v průzkumu. P.S. To jenom k té Petrově otázce. Raději bych se zeptal, kdo je schopen si přečíst alespoň se slovníkem tento článek hahahaha. A ty Honzo, už jsi si taky koupil hodinky na míru Prim od Elton hodinářská, a.s.? Když přemýšlím nad tím co píše anonym, tak docházím k názoru, že v na první pohled nesmyslné otátzce se skrývá hluboká pravda. Asi si raději půjdu koupit hodinky. Překvapivě ty hodinky nenabízel https://radiozurnal.rozhlas.cz/ludvik-cimburek-aktivni-zalohy-jsou-jedine-co-republika-v-dobe-miru-ma-7610672 ale podle obleku to nebude žadný chudý poradce. Nezapře inspiraci ex-generálním náčelníkem Šedivým: přijít, vidět a vytřít zrak. Toho poradce JC přes zdravou výživu ze Slušovic znám. Je docela dobrej. Byl jsem u něj a podařilo se zhodit osum kilo. Nevěděl sem, že tak dělá taky poradce v armádě. Ale dneska musí každej mít aspoň dvě zaměstnání aby se uživil. Ale ta armáda mu moc nejde. To co tam říká znám taky, ty čísla si sice trochu plete. Měl by se držet vy výživy. Možná tam v tý armádě taky v tyto oblasti radí. Prej kdysi nakoupili za těžký peníze prášky na hubnutí a pak někteří nestíhali porady jak je to prohánělo.